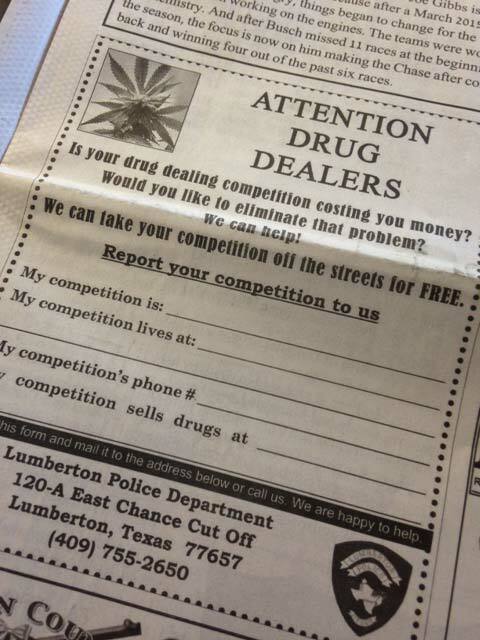 LUMBERTON, TX -- An ad in a Texas community newspaper calls for drug dealers to snitch on their competition. It was published in the August 5, 2015 edition of the Lumberton Ledger. It's more of a public service announcement, according to Ledger editor David Lisenby. He donated the space for it. It's a win-win, according to Lisenby. The ad was shared exponentially on social media and quickly went viral. "If it takes one drug dealer off the street, it's worth it," Lisenby told us. The page is meant to be cut out and mailed in. There's spaces right there for the drug dealer to write down not just the name of their competition, but the person's address, phone number and where they sell drugs. "I think it's pretty funny actually," said Lumberton resident Heather Wheeler. 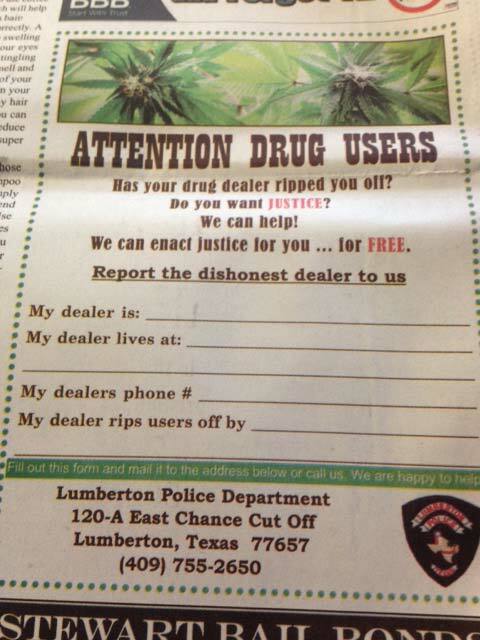 If the dealer would rather call police with information, there's a phone number at the bottom for the Lumberton Police Department. "I've never seen anything like it. I think it's very smart," said Lumberton resident Joe Nelson. Lisenby and the Ledger got such a positive response they did a second ad. This one targeting drug users, offering them "justice" for turning in a dealer who might have ripped them off. 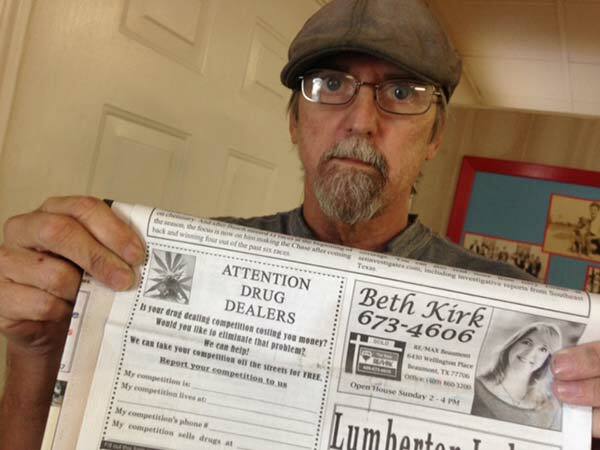 Police describe the drug problem in Lumberton as "moderate." Lisenby says the city population grew more than 35 percent between 2000 and 2010, suggesting that was part of the problem. "If this little ad will take one of those bad people out? Yay!" said Lisenby. Lumberton Police Chief Danny Sullins says they have received three or four submissions already. So far, no arrests. They're also getting a lot of prank calls - people saying someone they know is a dealer, apparently just as a joke. Sullins says there are also some callers who have cussed at receptionists, angry over the ad. It's unclear if those were drug dealers or someone else. The question now, of course: whether drug dealers read the paper? Maybe only the smarter ones.